Looks like a lot of the holidamakers have gone home – only 32 players this week for the modified bogy competition. This was where the player got a plus for beating par at each hole and a minus for failing to match par (after slope handicap allowance at each hole). One disappointing feature was that 5 players on the starting sheet failed to hand a card in or pay the 2 euro entry fee. This is becoming an increasing problem and although we are here to arrange golf for visitors everyone must contribute. It may be that entries are not accepted until membership has been paid in advance. This week was an individual event but you can imagine the disruption when players fail to show in team events. We do not want to ban players as happens in the UK as this is only holiday golf so please inform someone if you can’t play (contact details are available in the shop). The presentation was delayed this week waiting for cards which never arrived. It states on the sheet that cards must be submitted (and paid for) by 4.45pm with presentation following at 5pm. From next week we will apply this requirement. Anyway, there were some good scores with just one division. Next Friday is an individual stableford competition. Friday September 9th is Graham’s President’s day (drawn out texas scramble teams) with a party in Naranjos 4 garden. There will be a bar provided by Scottees restaurant and a DJ along with karaoke. Our diary/fixture list will go to print next Tuesday and all members will be issued with a copy (no charge). Several local businesses have purchased advertising space which will cover the cost. Thanks to Dave Lloyd who has managed the project from his home in rainy Durham, and the committee who have gone out and persuaded the advertisers to join us. When we have the finished version available it will be easier to sell advertising space next year. 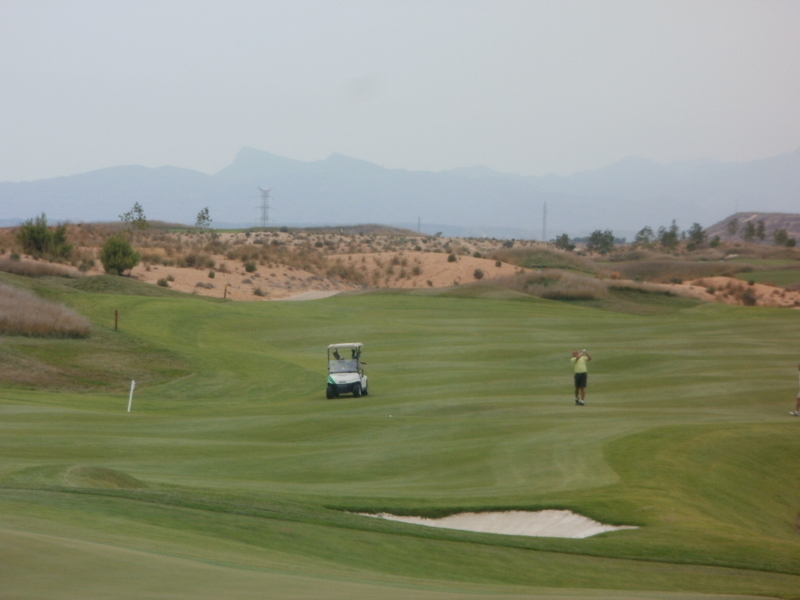 With over 650 members now and 6 more months of recruitment it should reach a vast audience at Condado de Alhama. 57 players took part in this week’s individual stableford competition under blue skies and in stifling hot conditions. Again, with these numbers, olagolf did not have enough buggies to go round. 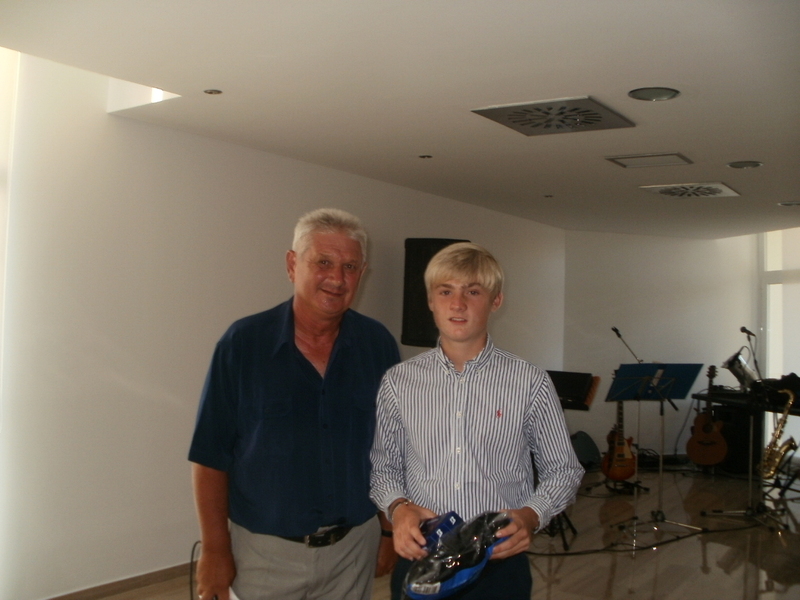 There were some good scores on the day with Steve Grundy scoring 40pts to take the guest prize. As at Friday night membership has reached 632 – excellent with 6 months still to go! From October we will have a small trophy for the overall winner of the first stableford competition each month. Then divisional prizes will follow. After the award of prizes we had a free card draw for towels and caps provided by the society for any golfers present. 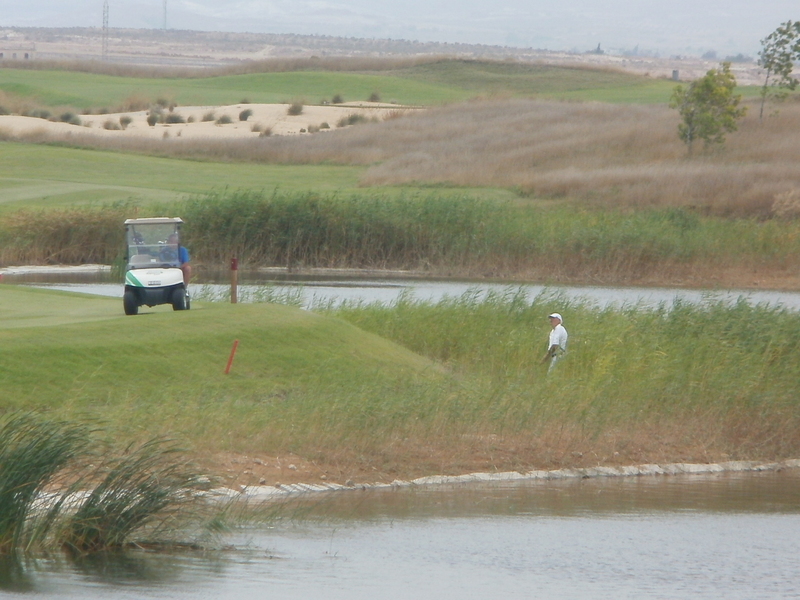 Next week we have the option of playing at Hacienda del Alamo on Wednesday (price about 40 euros with buggy). Starting times about 10 a.m. sheet is in the golf shop or email me. Friday will see us play a modified bogey competition for the first time. This is a plus or minus format. At each hole deduct your handicap allowance from your gross score. If your are then below par mark + if you are above par mark – if you are on par it is 0. At the end takes minuses from pluses to get your score. e.g. 7 pluses – 3 minuses is a score of +4 (which would be very good!). This means that as soon as your score is a minus (after slope handicap allowance) pick up and move to the next tee – don’t slow other players up by putting out. Conversely, if you get a birdie 4 at a par 5 for example and you have a shot it is wasted – a nett eagle is still a plus the same as a birdie is! So you can just lag up for a par – nett birdie. It is something different. A reminder that President’s day is on September 9th followed by food and entertainment in the garden of Naranjos 4. This will be the popular texas scramble format. Shirts are still available from Cath & Kev in the bar Wednesdays and Fridays. Sorry for the late post but I have been on holiday for a week and Phil has also just departed for France. 63 players played on Friday in the 4 person team texas scramble which everyone seemed to enjoy. One difference this week was that any drive could be selected – not a minimum of 4 per player. As usual all players played off their slope handicap. The first 4 teams were seperated by only 0.4 of a shot – so looks like the handicapping system was correct. I have the results from the fiesta golf competition played on Sunday (not a society competition but it included many society members). This is because so many golfers complain when they go in the waist high grass at Condado. If you find it, it is usually unplayable but that is your choice. Firstly if you see your ball disappear into the tall grass play a provisional ball stating to your partners that you are doing so (this saves time walking back). If you then find your first ball you do not have the option to play your provisional – the first ball is in play. (e.g. play 3 off the tee – you cannot use your provisional shot). b. Drop a ball behind the point where the ball lay,keeping that point directly between the hole and and the spot at which the ball is dropped, with no limit to how far behind that point the ball may be dropped. c. Drop a ball within 2 club-lengths of the spot where the ball lay, but not nearer the hole. The ball may be lifted and cleaned under this rule. Matchplay – loss of hole. 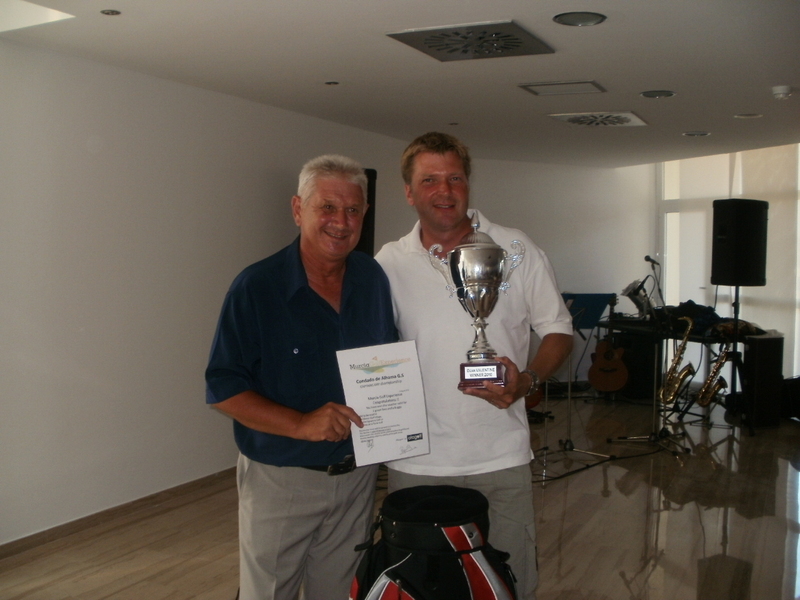 Strokeplay – 2 shot penalty. Interference from planted ornamental grasses and shrubs – free drop within one club-length of nearest point of relief. Ball in water channel in sandy areas – free drop within one club-length from nearest point of relief. Hope this clears up some uncertainties. We are in the latter stages of attracting advertising for the fixture list/diary for 2012, which members should receive free. Next Friday is an individual stableford competition. Presidents day is Friday September 9th. 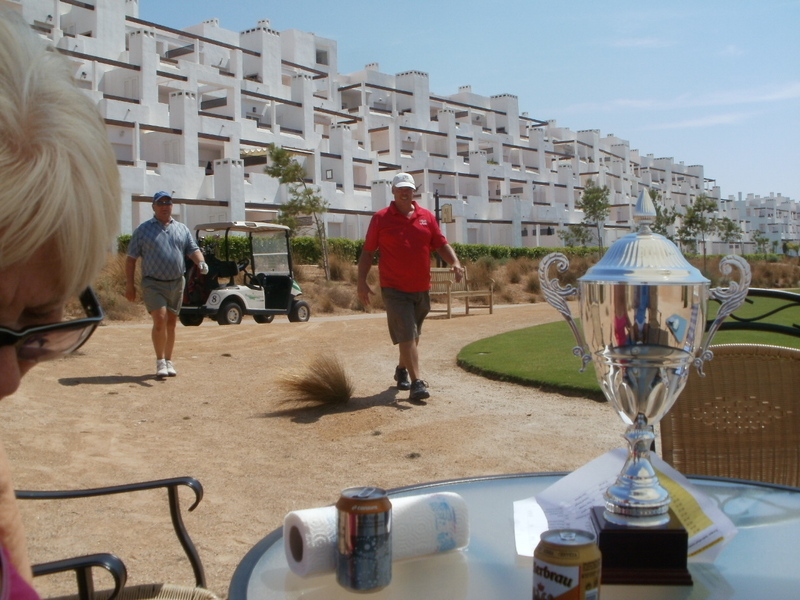 Captains day at Condado started with blue skies and no wind, although it did get up well before the last match set off. Another record entry of 70 players with the course in superb condition thanks to Alex and his staff. Unfortunately with only 23 buggies some had to walk on another hot day. couple of melons?..or should I say lemons? 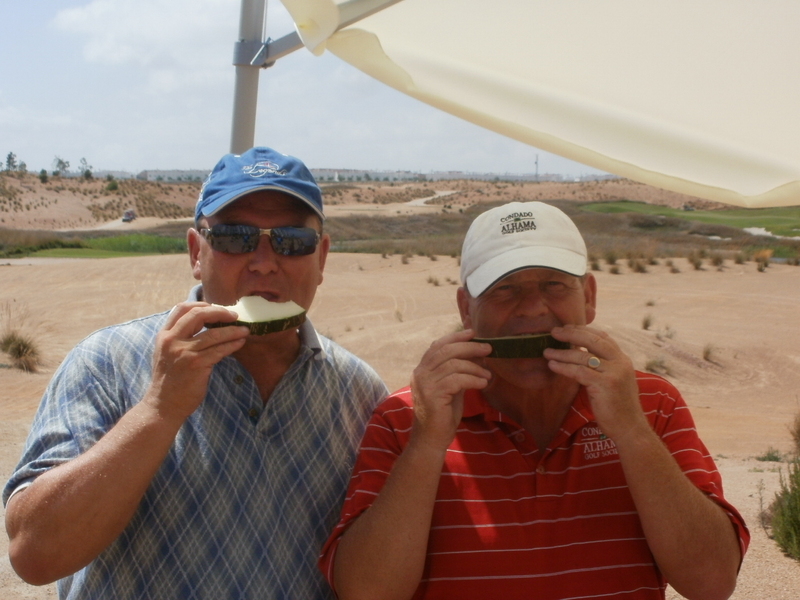 Sue and Pauline provided drinks and cool fruits at the 12th tee which allowed a few frustrated golfers time to cool down. Our thanks go to Ian and Jane who supplied the big umbrella from meerkat manor. 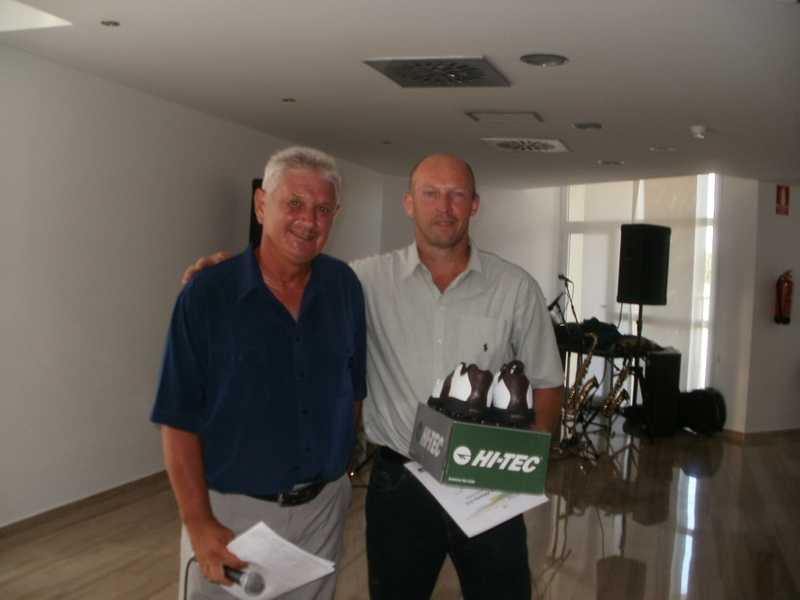 Prizes were on offer for the nearest to the pin on all 4 par 3 holes and we had a longest drive competition on the 18th. Many of the golfers also took part in the 2’s sweep (there were seven 2’s on the day). After the game Graham and Kevin were overseeing the hole in one competition on the practice green. The test was a difficult uphill breaking putt of about 25 feet and players got 3 balls for a euro. after 55 players attempted the putt (3 each) only Paul Harrington (h/cap 3.7) and Phil Tann (h/cap 28) were successful. That shows anyone has a chance! Any player playing to their handicap was in with a shout but in the end Graham Hubbold (h/cap 10.5) came out on top with 40 points, finishing 3 points ahead of the field. Harald Wibye also had a fantastic day scoring 35 pts to finish 2nd in division 1, being nearest the pin on no 7, having a 2 and smashing the longest drive. 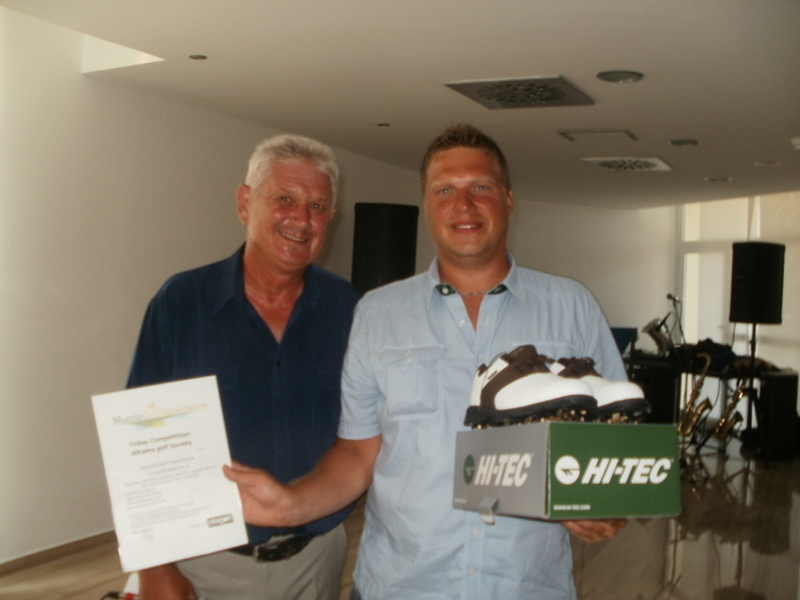 Thanks to our sponsors for the golf prizes- this helped to make it a very successful event. Carol (From Hair by Carol) donated a ladies cut and blow dry and also a gents cut. We also used the occasion to mark our 500th member which has now reached almost 600. Membership only started on March 1st so it proves how popular the golf cociety has become. Cath put the membership numbers of the first 500 members in a bag and James Marney (h/cap 24) was pulled out. If James can contact us we have a voucher for 2 players and a buggy waiting for him. 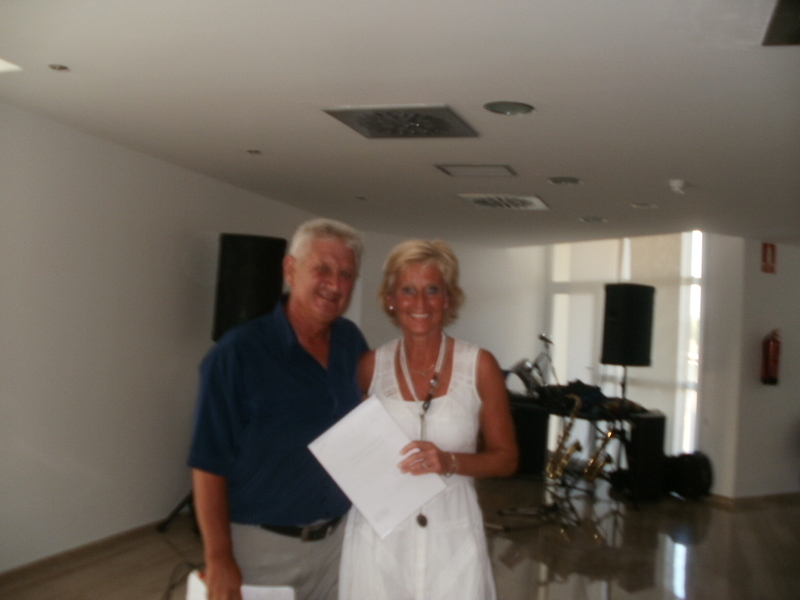 After the golf over 90 members, friends and family descended on the Sensol hotel in Camposol. Prize giving was first, followed by a buffet and then some great golden oldies from the Beagles. 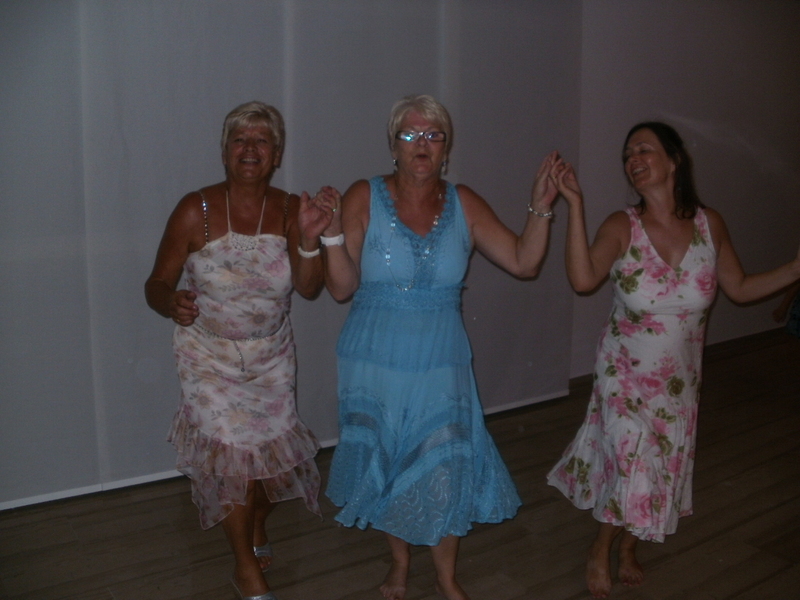 Everyone was in the mood and the dance floor was full. 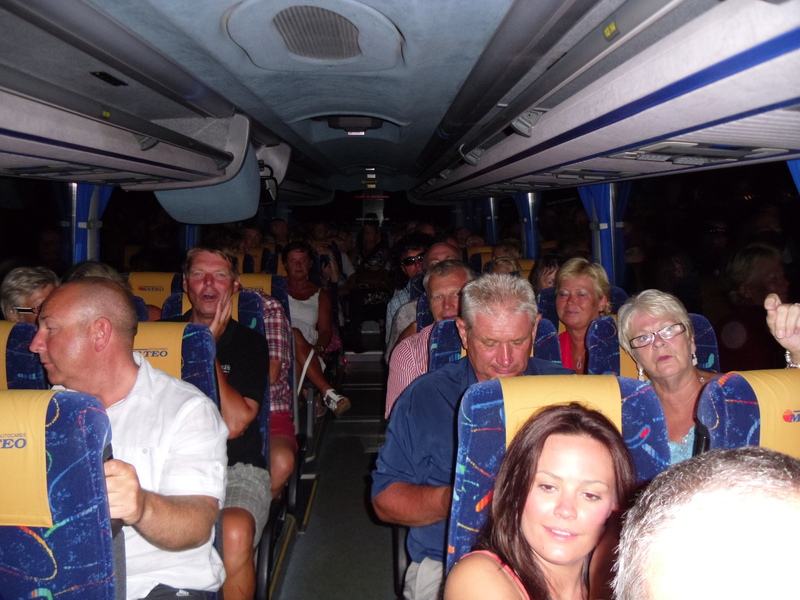 00.30 was time to go, and Cath led the singing on the coach home. 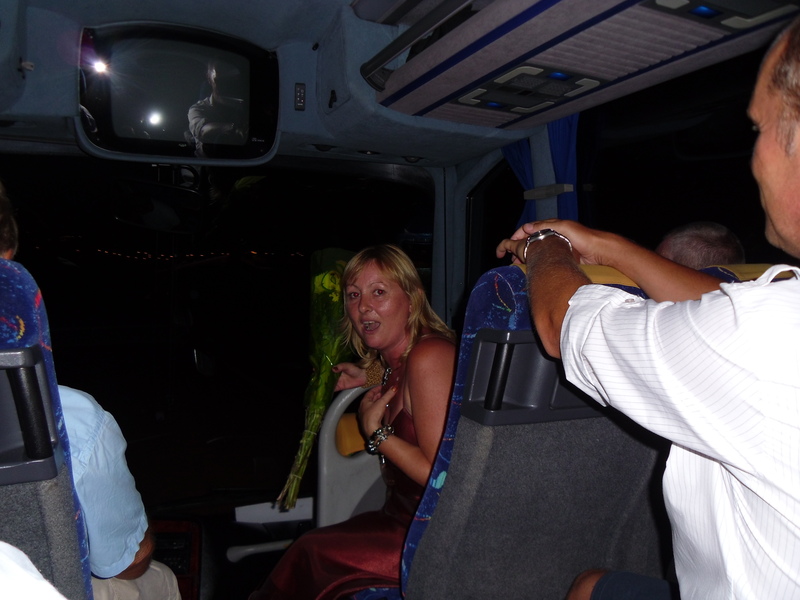 I had a great day and I think all the golfers and guests at night thoroughly enjoyed themselves. Time to relax now with the next big event being Graham’s Presidents day on September 9th. Next week is the very popular 4 person texas scramble. 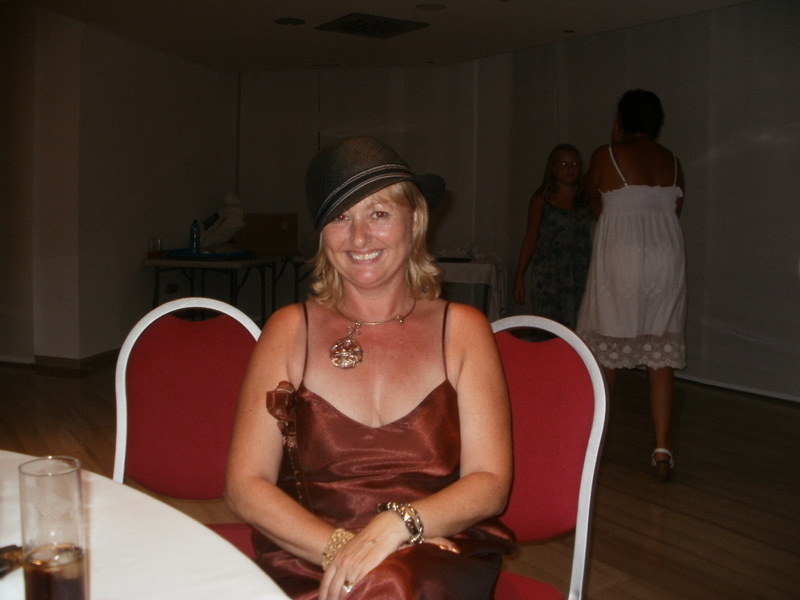 A weeks holiday now on the Costa del Sol!